Comb Jellyfish (Mnemiopsis leidyi) have increased by 5000% since their unwitting introduction to the Caspian Sea. Today the world’s oceans are under attack, and armies of seaborne invaders are threatening life as we know it in our shallow seas, coastlines, and rivers. In the Caspian Sea, an invasion of jellyfish has all but eradicated local fish stocks, decimated a once thriving fishing industry, and now threatens the future of caviar production in its traditional home. In South America, the world’s largest wetland, the Pantanal, is also under threat, from silent Asian killers who threaten to destroy its fragile ecosystems. One phenomenon more than any other is responsible for these invasions, the transportation and release of potentially invasive species around the globe on the hulls and in the ballast tanks of container ships. Modern cargo ships are responsible not only for the transport of goods, they also move up to five billion tonnes of seawater around the world each year in their ballast tanks, transferring over ten thousand different species such as plankton, plants, fish larvae, mussels, and jellyfish to foreign waters, often with devastating consequences. Most of these potentially invasive organisms would never normally travel from one side of the world to the other however, thanks to the modern international shipping industry, species now make journeys that would previously have been impossible and marine bio-invasions are now happening all over the world. The arrival of alien species in unique marine habitats not only poses a threat to fragile local ecosystems and biodiversity, it also represents a potentially lethal challenge to critical strategic infrastructure such as power and desalination plants, local maritime economies, and even human health. One of the most devastating marine bio-invasions has been taking place in the Caspian Sea, where the comb jellyfish, Mnemiopsis leidyi, was introduced in ballast water carried from North America in the 1980s. Since then, the population of the jellyfish, which feeds unchecked on the roe and larvae of indigenous fish species, has risen by over 5000 per cent, devastating local fish stocks and decimating a once thriving fishing industry. Even the lucrative Caspian caviar trade, which depends on the health of the beluga sturgeon, is at risk as the fish, now starving, are no longer able to produce the same quantity of eggs. In the early 1990s, strains of cholera were introduced to South America in ballast water transported from South Asia. When a freighter discharged its ballast tanks in the warm and polluted waters off the coast of Peru, the bacterium reproduced and made its way into the human food chain via shellfish. The result was an epidemic that spread throughout South America, affecting more than a million people and reportedly killing more than ten thousand by 1994. Importantly, the UAE has also felt the effects of marine bio-invasion. In August 2008, what looked like a giant red stain appeared on the surface of the water off the coast of Fujairah and Sharjah for more than nine months. 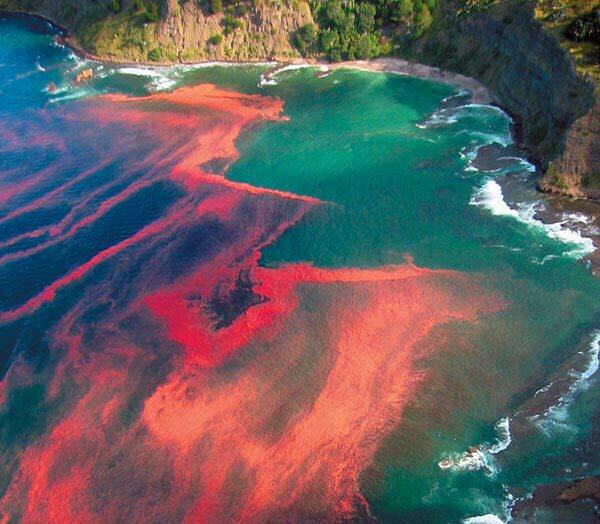 Known as a ‘red tide’, the phenomenon was actually a mass of microscopic living organisms that resulted from an algal bloom. Red tides occur naturally when changing ocean currents disrupt the nutrient cycle of coastal waters however, their effects can be disastrous if blooms accumulate at the surface of the water and then decay as that process strips oxygen from the seawater, killing any living organisms in the process. Red tides are also capable of producing a deadly toxin that can kill some marine creatures by attacking their nervous system. Shellfish however, remain unharmed and while the poison accumulates in their bodies, they appear normal. If affected shellfish are eaten, paralytic shellfish poisoning may occur and if this is untreated, death can occur in humans 24 hours after ingestion. Not only did the UAE’s recent ‘red tide’ affect the local fishing industry and the price of fish, it also forced the closure of coastal desalination plants at an estimated cost of more than Dhs368,000 per day. Alongside climate change, marine pollution, and over-fishing, scientists identify the impact of invasive species as one of the four greatest threats to the world’s wetlands, rivers, coasts, and oceans, as Markus Helavuori, a marine biologist and technical office at the United Nation’s International Maritime Organisation (IMO) explains. For Helavuori, the biggest issues associated with marine bio-invasions are their frequent invisibility, unpredictability, and the fact that they are irreversible. Thanks to the work of scientists in Germany and the United Kingdom, the world’s first computer model has been created that tracks the movements of international cargo ships and predicts the likely hotspots where marine invasive species are most likely to originate and to thrive. Colours indicate the probability of invasion by ballast water exchange of cargo ships. Lines show the shortest path on water between two ports. The method for link calculation and visualization was kindly provided by Dr. M. Gastner. The research, published recently in the journal Ecology Letters, identifies Singapore as the world port at highest risk of bio-invasion, followed by the Suez Canal, Hong Kong, and the Panama Canal; however, of the top twenty most vulnerable ports globally, two are in the UAE, with Jebel Ali featuring at number nine and Fujairah at sixteen. The next highest ranked at risk ports in the Arabian Gulf are Khor Fakkan at 54 and Port Rashid at 62. The research also identified the ports that pose the greatest risk to others, with ships from Singapore representing the biggest risk for both Mina Jebel Ali and Fujairah. The problem of transported ballast water begins when empty ships fill their ballast tanks with seawater in lieu of cargo. All ships must carry ballast, to keep them steady in the water and when unloading cargo, a ship has to take on ballast to stop it rising up out of the water and capsizing and so water is pumped into specially designed tanks along the sides and bottom of its hull. The vast majority of organisms transported in ship’s ballast water do not survive thanks to the length of voyages and a general lack of oxygen and light, but the very hardiest species do and it is this ability to endure that makes them potentially invasive species at their destination. According to Professor Bernd Blasius, the leader of the Anglo-German research team, three main factors determine a port’s vulnerability to invasion; the number of ships it receives, its location, relative distance from other ports, and a similarity in environmental conditions between points of arrival and departure. Given Jebel Ali’s size and location, it is perhaps not surprising that it should figure in the global top ten. One of the world’s largest man-made harbours and the biggest port in the Middle East, Jebel Ali is the largest container port between Europe and Asia. It receives 170 different shipping lines, with more than 90 weekly services and is connected to over 100 ports worldwide, while the port of Fujairah deals with 75 per cent of the region’s bunker market and is the area’s fourth largest container port. Rather than focusing on the impact of a single alien invasive species, the report’s authors created a mathematical model and adjusted this with observations carried out in the field. Their aim was to establish the probability that a species might survive the journey from one point to the next and then establish a population in a subsequent port of call. The researchers eventually constructed a model of the global shipping route network using data from the mandatory Automatic Identification System, which reports ships’ approaches to coastal stations. Their network included 32,511 ships that made 2,892,523 journeys to 1,469 ports in 2007 and 2008. This information was then combined with other factors known to affect the survival of alien species including the size of the ship — the larger the boat, the greater the probability that it will play host to invasive species — as well as comparative salinity levels and sea temperatures between ports. Professor Blasius’s team calculated that trade routes involving intermediate distances – between 5,000 to 6,000 miles — and journeys that started and ended with similar environmental conditions were most vulnerable to bio-invasion. “If you are travelling 20,000 km, it is rather unlikely that an organism will survive this, as ballast water is not the most cosy environment to live in,” explained one of the report’s other authors, Dr Michael Gastner in a recent statement. “There is a certain intermediate range of distances that you can survive as a potential invader. You are the new kid on the block and can increase your population in a very short time,” he added. While the growth in cargo carried across the oceans means that the risk of future invasions is severe, Professor Blasius and his team also believe that tackling the ballast water issue can be a powerful means of mitigation, as do the IMO who introduced an International Convention for the Control and Management of Ships’ Ballast Water and Sediments in 2004. The Convention was designed to prevent the spread of aquatic organisms from one region to another and to reduce the harmful impact of organisms carried in ballast water by establishing standards and procedures for ballast water management and control. Unfortunately, the treaty has still not become law, as there is a requirement that it be ratified by at least 30 states, representing 35 per cent of world merchant shipping tonnage. Despite the fact that 36 countries have ratified the Convention, they represent only 29.07% of the world’s tonnage. Markus Helavuori believes that ratification is necessary and inevitable however, the fact that he has no way of knowing when the necessary tipping point will be reached is an understandable source of frustration. This is just a wonderful article about a very scary situation. I thoroughly enjoyed reading about this subject and learning more. I hope that the issues receive the attention they need. I think your article will help do that.